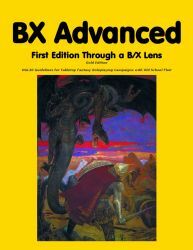 The Gold Edition of BX Advanced: First Edition Through a B/X Lens is now available! RetroRoleplaying Cancer Fund donors can download a password protected zip file with a copy at the usual “donor download” place with the usual donor password. Microlite74 Plus: Four Attributes or Six Attributes? Awesome. I was tinkering in the same direction. Is there a editable textfile?